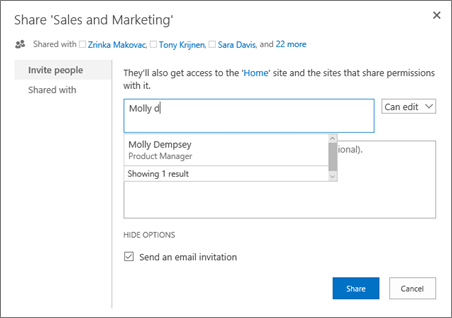 You can use the Share command to invite other people in your organization to a site. If you have just created a new site, this is a quick way to grant permissions to the people you want to use your site. Sharing a site is also a great way to kick start collaboration on a project by granting people access to all of the relevant documents and information. If you are a Office 365 customer, you may also be able to use the Share command to share sites with external users who do not have licenses for your Office 365 subscription. For more information, see the article Share SharePoint files or folders in Office 365. Go to the site you want to share, and click Share. In the Share dialog box, type the names of the people in your organization that you want to invite to the site, or type Everyone to share with everyone in your organization. Type any message you want to include with your invitation. Note: If you are not a site owner, you can also invite other people to a site, but your invitation will generate an access request that can be either approved or declined by the person who is the site owner.